Because it's Verizon and pre-paid, this phone is probably either locked to Verizon's service or so limited in terms of bands that trying to use it with another carrier is out of the question. Even so, such a rock-bottom price for a technically decent phone is hard to sneer at - it might be worth a look as a backup or Wi-Fi-only device even so. With a Snapdragon 410 processor, 2GB of RAM, a 5" 720p screen, 16 gigs of storage plus MicroSD card slot, and Android 6.0, it's as good as any phone you're likely to find for under a hundred bucks. And who knows, maybe you actually want Verizon's prepaid service to boot. There's no indication of how long this sale will last, but since it's Cyber Monday, you might want to get an order in sooner rather than later if you want one. 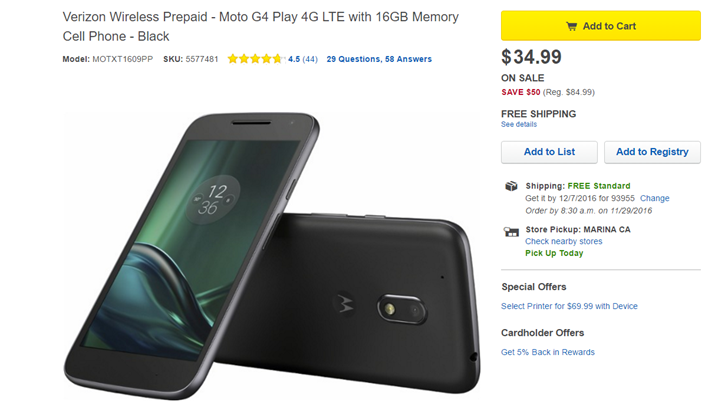 Standard shipping anywhere in the US is free, and Best Buy is also offering in-store pickup if your local retailer happens to have the phone in stock (which most do). Happy hunting.